It was so overwhelming once I started looking for a wedding venue. I was only focusing on NJ venues too. After browsing a couple dozen online, they all started to look the same with their grand ballrooms and gazebo and arch ceremonies. I wish I went about it more organized. At first I was just glancing to get an idea, then I tried to make a spreadsheet, but it was all too much for me by then, and I started to get confused at what I had seen already, and reasons why I liked or disliked a place. I had started to casually research in October..and then seriously looking in late December. I want my wedding in May 2015, so I thought I still have plenty of time even if i booked mid year. But my potential photographer friend told me she already had a date booked for May 2015! So that's I went to visit my first venue in late January. Before you start looking up venues, have in mind what kind of wedding you want, so you can filter out ones that won't fit your requirements. I knew I wanted an outdoor wedding ceremony and a nice impressive ballroom that'll be fun for dancing. It should also have a nice indoor ceremony alternative in case it rains. I want nice grounds for pictures. And of course, good food. 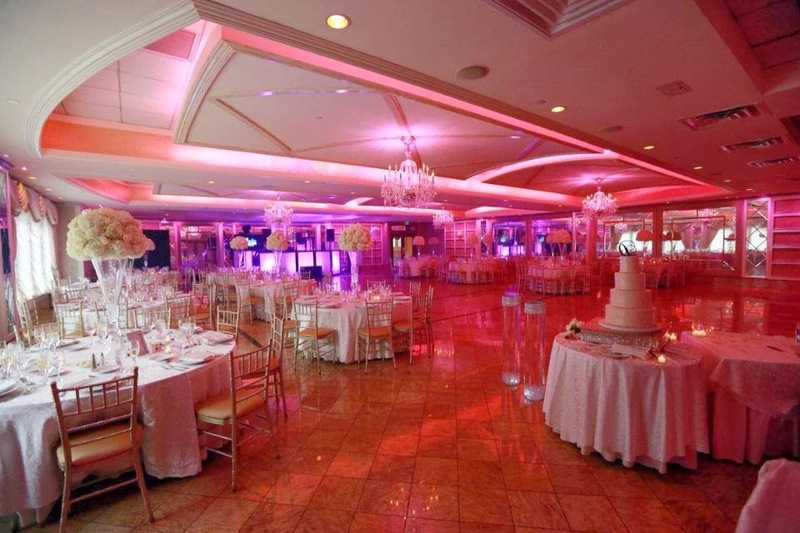 The second venue I visited was located in Washington Township, NJ. It was a typical grand venue with a big cocktail hour. 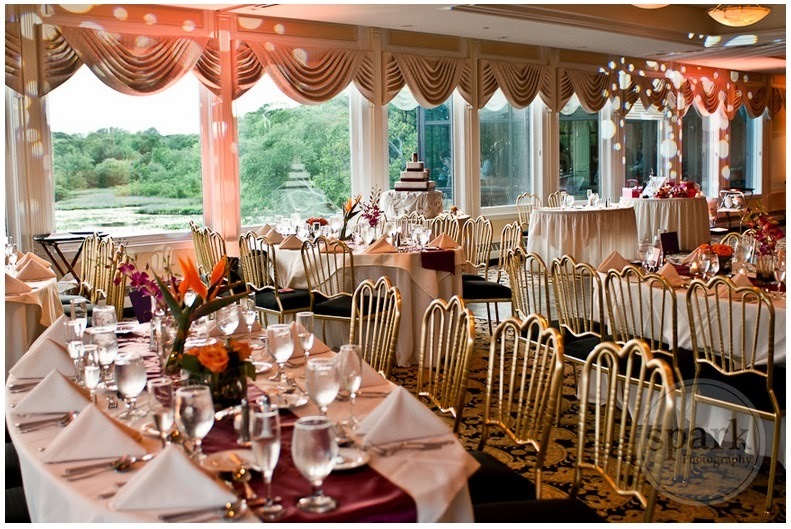 We have a small wedding, so we would get the smaller upstairs ballroom, which required a 125 minimum. The ballroom would be where the ceremony takes place. The outdoor waterfall ceremony is reserved for the downstair ballroom. That was a big bummer. After the ceremony, you go down the hallway to the cocktail room. They offer a big cocktail display if you have 125 minimum. There's also the option of a smaller cocktail of hor d'oeuvre only if you have a smaller wedding of 100 people. With the difference in menu, it's definitely more worth it trying to get the 125 guests. As much as we are impressed with the food and pricing at Seasons, the venue just isn't what we are looking for. The third and final appointment we made was at Spring Lakes, NJ. This place just about had everything we wanted. The ballroom was the best part. It is ceiling to floor windows, with a view of the beautiful lake outside. Giving lots of sunlight and charm to the place. The outdoor ceremony was great too. Right next to the lake on a stone floor with gazebo. It's really serene and beautiful. The backup ceremony would be in their ballroom or atrium. The atrium was also entirely windows and where the cocktail hour would be. The thing with this place is that the downstairs is their restaurant. The entire party would be on the second floor. At least it is only 1 wedding at a time. But that is basically the only spot your party will have, there is also no outdoor grounds for pictures besides the ceremony spot. We would have to drive a few minutes to a nearby park, which is not too bad. This place definitely looks a bit cleaner and fancier than our First Venue. I know my family members would have preferred this over my other choice. The guests would definitely be impressed with the location, but that would probably lasts like 5 minutes. We just thought the food lacked a bit in comparison. The menu wasn't bad but it wasn't impressive either. Like typical american wedding food. It seemed to offer a little less with slightly higher price (Deluxe Menu). We thought it over for dayssss... nearly on the verge of going with it. But we decided to go with the First Venue. Menu and Pricing can be found on their website. Basically, I feel screwed if it rains on my wedding day. But with the frustration of looking for more venues that don't meet my expectations, and this feeling that I can't let go of Perona, I decided to go with my gut feeling and take the risk. So let's pray it is a beautiful day on, Sunday, May 24, 2015! 100 guests minimum for Sunday, Florentine Room - $95pp (Friday - $100, Saturday - $125). I was able to negotiate a little, but they wouldn't budge on including anything extra or any type of haggling like switching stations, offering a 3rd entree choice, champagne upon arrival to guests. I feel like these are small matters that wouldn't make much of a difference to them. So that was a little disappointing. Barn reception, is pretty cool, but not for me. Barns bridal room. very woodsy and bare. First of all, congratulations on your wedding! I'm glad you were able to check different potential venues, services, and even cost. That means you were able to get your money's worth from your wedding. While weddings are usually extravagant affairs, it doesn't mean that you have to get the most flashy and premium services out there, no matter what the price. Anyway, I hope you guys were able to sort out and choose the best options available. Good luck!